The Summerville Police Department utilizes two prominent breeds of working dogs. They are the Belgian Malinois and the German Shepherd. The most popular breed of police dog is the well known German Shepherd, a 200 year old breed in the herding class of working dogs. These dogs have long been used by militaries all over the world as sentries and were used by the United States and Germany in World War I, World War II, the Korean War and the Vietnam War. 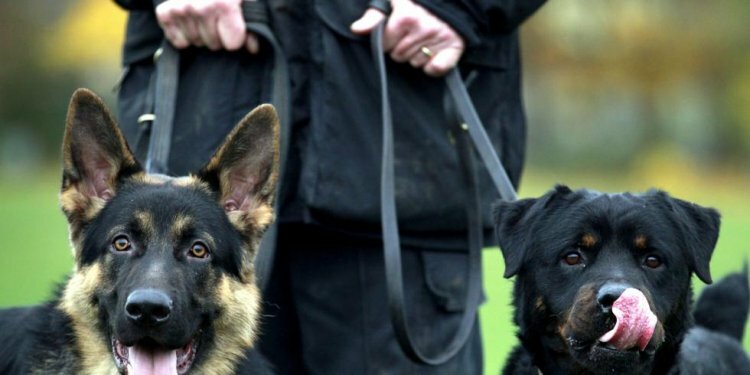 In the 1950s, law enforcement began using German Shepherds for crowd control. As time progressed, the negative portrayal broadcast during this era led to new standards and levels of training for the canine and the handler. Today, German Shepherds remain the most popular breed of police canines in service around the world as they are most well known for their size, keen intelligence and work ethic. As previously mentioned, we have one Belgian Malinois in service here at the Summerville Police Department. The Belgian Malinois (pronounced Mal-In-Waw) is a smaller, sleeker version of a German Shepherd. These animals are all imported from Holland, where they are primarily used for sheep herding. They are hard working dogs with a high level of endurance, noted for their speed and agility. This 135 year old breed is noted for its intelligence and high intensity nature. The Malinois breed is becoming more popular in law enforcement as its reputation spreads. Today, it is the second most popular breed of canine in service in the United States. In the past we have had the pleasure of having Labrador Retriever’s in service. The Labrador Retriever’s is so named because of their unique ability to retrieve fish or game that has been hunted or caught. These dogs are very intelligent and maintain a high level of obedience and intensity. They are very popular choices for agencies searching for non-aggressive or passive dogs to work in a single-purpose capacity. Labs are very effective and well loved by everyone. Many people identify with the Labs since it is a popular breed of domestic pet. There are two ways that police canines are trained to alert to the odor of their specialty. The first way is called a "passive alert" or indication, common among explosive detection canines and narcotic detection canines where a non-aggressive response is preferred. Utilizing this method, a canine sits when it smells the odor that it is trained to detect. The common indication for explosive detection canines is by passive alert, for obvious reasons. The sudden jarring or impact of the explosives could cause a detonation. The second way that a police canine is trained to indicate is called an "aggressive alert." This type of alert is the most common among dual-purpose utility police canines as the dog is trained to show indication by vigorously scratching and barking at an item that contains the odor of the substance of the dog's specialty. The most popular specialty for aggressive alert dogs is narcotic detection. This enables the dog to more closely indicate where the hidden or concealed substance is located.